Crazy II - The Chip's Challenge Wiki - The Chip's Challenge Database that anyone can edit! Is this thing hard, or what? Crazy II is the 200th and final level in Chip's Challenge 2. It was created by Chuck Sommerville. 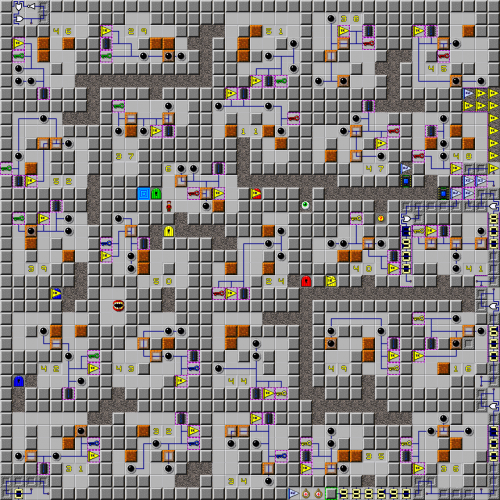 As in Crazy, this level contains 26 small Sokoban puzzles which were automatically generated by a computer program developed by Yoshio Murase, Hitoshi Matsubara, and Yuzuru Hiraga of the University of Library and Information Science in Japan. In order to score the maximum bonus, Chip must solve all 26 puzzles and loot the first bonus room within 10 minutes, bringing the score up to nearly 2 million points. 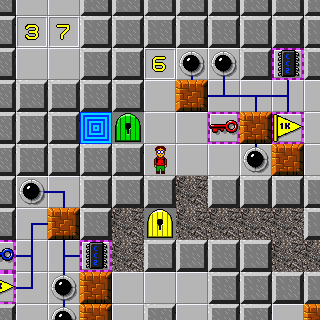 In order to double the score again, Chip must then wait a further 3 hours (3.14 from the beginning of the level) for a timer to open the door, which gives a 20 second time limit to reach the exit from this point. In the original release of CC2, this timer would take 3.14 days to overflow, though this was thankfully nerfed. Simply beating the level only requires solving one from each set of puzzles, however. This page was last edited on 20 January 2019, at 17:40.